Rumpelstiltskin and the Number 3. In the end, Rumpelstiltskin becomes the tricked instead of the trickster. First, he is the trickster and then the others turn the tables and trick him. By calling out his name, he looses his powers. In my collage, Rumpelstiltskin has come to claim the first-born and I am showing the moment just before the group chants out his true name. One of the aspects of the story that I liked was the use of the power of three. The spinning wheel goes whirl, whirl, whirl turning the straw into gold. Rumpelstiltskin gives the Millers daughter 3 days to guess his true name. She has to turn three rooms full of straw into gold. He comes for the baby three months after it is born. The Jaybird, the squirrel and the foxes attract the Game Keeper. He hears the voice of Rumpelstiltskin and watches while the goblin sings and dances around the fire. Three is a magical number in fairy tales. In most cultures and religions, numbers are carriers of symbolic meaning with often-complicated significance. Numbers are frequently expressions of the cosmic and human order or of the harmony of the spheres. Three is a particularly significant number for most peoples. It is the synthesis of one and two, the symbol of the principle that embraces all, the image of mediation, and the number of sky (heaven) in contrast to that of earth the number four. The symbolic meaning of three probably relates to the elementary experience of productive fulfillment in the trinity of man, woman and child. Three also forms the basis of numerous systems and ideas of order. Multiplicity; creative power; growth, overcoming duality, expression; and synthesis are associated with the number three. Three is the first number the word “all” has been appropriated. The number has a beginning, middle, and end. It is man as body, soul, and spirit. It is birth, life, death, past, present and future. It represents father, mother and child. Once, twice can be a possible coincidence, but three times carries certainty and power. Folklore has three wishes, three tries, three princes or three princesses, witches, fairies. Three being equivalent to the many, can symbolize a large number, a crowd, three cheers, and signifies fulfillment. Lunar animals are often three-legged. Three is the number of good fortune. Bad luck comes in threes. Counting to three is the minimal amount of counts while setting the rhythm or rate. The third time is a charm. In baseball, the batter gets three strikes before he is out. There are three outs and the side is retired. In this story of Rumpelstiltskin, the number 3 plays a key role. 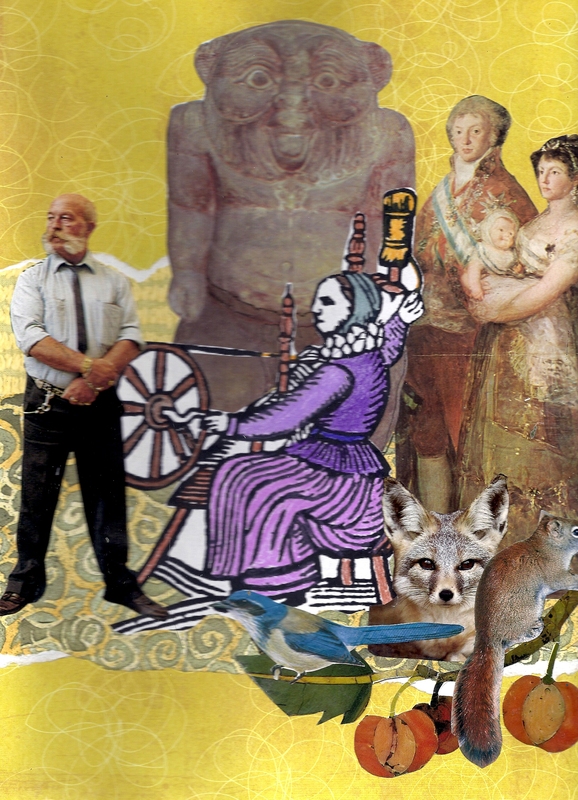 In the collage, and old woodcut shows a spinning wheel and a woman spinning. The Miller and the Goblin accompany her. The King, Queen and the first-born are watching. The Miller stands defiant determined to foil the goblin. When he hears his name chanted Rumpelstiltskin is so enraged that he stomps his foot driving it into the ground and then yanks his other leg so hard that he splits himself in two. This story comes from the Bible and the book of Genesis. About 2,000 BCE Abraham lived in Mesopotamia what is modern day Iraq. Abraham’s father, Terah was the tenth in descent from Noah. Abraham believed in one god, Yahweh. At that time, the majority of the people worshiped many gods. In Egypt there was Isis and Osiris, in Sumer the people were familiar with the story of Inanna and Dumuzi. In a dream or vision Abraham’s God told him to leave his home, the place where his family had lived for almost 75 years. God said he would lead Abraham into the desert to Canaan, the promised land, where he would start a new nation. God said he would bless Abraham with sons. God also said that if Abraham was obedient and make God his only God, Abraham and his children would be God’s chosen people. This was the covenant Abraham made with God. Abraham was married to Sarah. Sarah was barren. The couple had no children. They were both elderly. But Abraham believed in God and knew that what God told him would come to pass. God said, “Look up at the stars, you will have a son. He will have children, and from them a great nation will come. Because of God’s promise all people on earth would be blessed. Sarah felt bad that she had not given Abraham children and decided to offer her husband Hagar, her maid servant. Hagar was young and Abraham agreed. After Hagar got pregnant with Abraham’s child her behavior changed and Sarah got angry and treated Hagar poorly. In time Hagar runs away. God appears to Hagar and promises her that if she goes back and serves Sarah that he will make sure Hagar will see that her son Ishmael will be the father of so many children that no one would be able to count them. When Ishmael is born Abraham was 86 years old. When Ishmael is almost 14 years old Sarah conceives Abraham’s son Issac. This is a miracle because Sarah was over 90 years old and Abraham was almost a hundred. 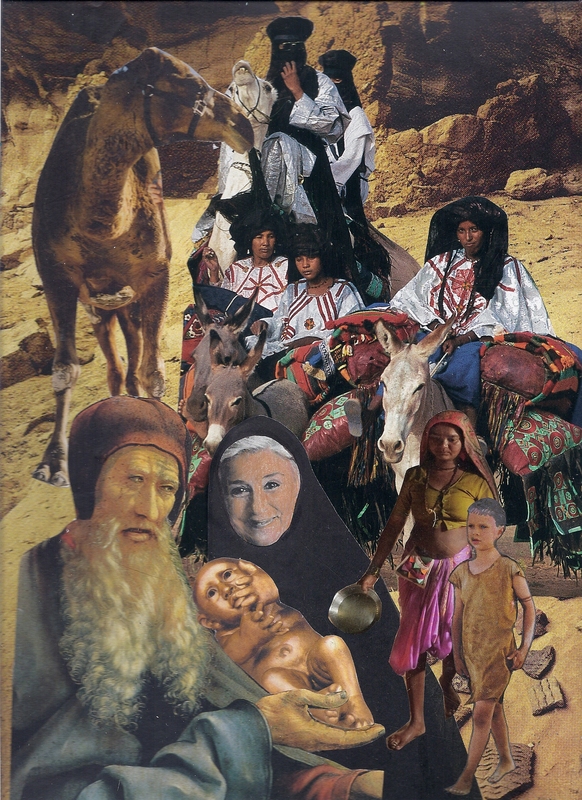 In my collage I show Abraham, Sarah, Hagar, Issac and Ishmael. From Abraham and Sarah comes Issac, and Issac gives birth to Jacob and from this line comes Jesus. From Hagar and Abraham comes Ishmael and from this line comes the life of Mohammed. 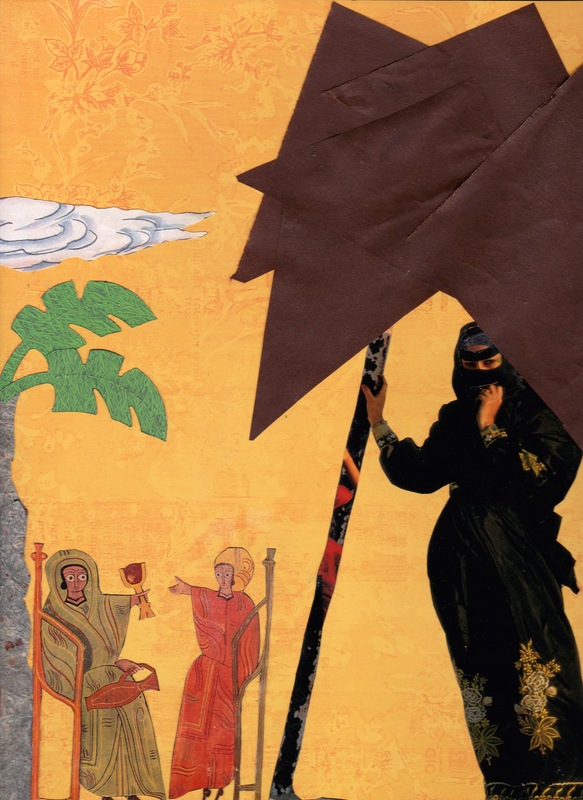 From the figures in my collage comes 3 major religions.. They are Judaism, Christianity, and Islam. One day, God took with him two angels and went visiting, disguised as a wayfaring stranger. Abraham, obeying the ancient laws of hospitality ran out to welcome the weary travelers in. He ordered a lamb slaughtered and sent Sarah to bake bread. Seating the stranger in a place of honor, he offered him wine, dates, almonds and salty olives. God, pleased with Abraham’s kindness to strangers, promised that Sarah, who had been barren her whole long life, would soon bear a son. Sarah, eavesdropping on their conversation from within the folds of her tent laughed to herself at the idea. God heard her and asked Abraham why she laughed. Sarah, frightened, denied that she had. “Yes you did,” said God. What a strange and wonderful story this is. I’ve read several interpretations of Sarah’s laughter – some describe it as a peal of joy, others as a snort of derision. In the entire Bible Sarah is the only person who is described as laughing. Laughter is mentioned in a few other places and a couple of times groups of people laugh scornfully, but no other individual laughs. This is an old old story, repeated hundreds of times before it was written down more than six hundred years after it was first told. Why did this little detail of one woman’s quiet laughter survive? I found a great article by Richard Restak on the psychology and physiology of laughter. Basically, laughter releases endorphins that make us feel good. It relieves stress, alleviates anxiety and lowers our blood pressure. Laughter also dispels nervousness, eases social situations and creates feelings of companionship and good will. Laughter can also be derogatory, self-deprecating or ironic. Maybe God’s insistence that Sarah acknowledge her laughter was a way of underlining the importance of laughter. Maybe, it meant, “don’t undermine your own human nature.” Perhaps it serves to remind us to stay present and take ourselves less seriously. Consider how important the issue of reproduction was and still is to many women. Then and now, it bears directly on honor, shame, status, fulfillment, personal happiness and identity. Sarah had been living with the burden and shame of being barren for her whole life. Her reaction to Hagar and Ishmael indicates great defensiveness around the subject. Maybe the story tells us that relaxing our hard grip on the identities we create for ourselves opens an opportunity for change. Look how often women who try for years to become pregnant finally conceive after giving up and going on vacation or adopting a baby. There are many ways of being pregnant with things other than babies – dreams, projects, causes, art. For any of them to come to fruition we need to relax, breathe, and let go of outcome. We need to laugh. Especially we need to laugh at ourselves and the absurd situation of being human. It difficult to be self-aware. Consciousness is both blessing and curse, it can heal but also cripple. Laughter, a phenomenon that even now scientists cannot entirely explain, explodes paradox and shifts our perspective. It breezes like a cleansing wind through our darkest passions and most twisted assumptions, if only we let it. The story tells us to remember, honor, and use this gift as an antidote to suffering. In this collage we see Abraham relaxing together under the trees, drinking wine. Sarah, having heard her name spoken, leans against the tent pole eavesdropping on the conversation. Traditionally in those days, when a man and woman were depicted together in a work of art, particularly if they were “man and wife,” the woman would be drawn smaller than the man. Here I’ve reversed the tradition because it is Sarah’s story that interests us; her emotions drive the story and it is her laughter we remember. The Serpent is one of the oldest and most widespread mythological symbols. Its meanings are highly complex. The Serpent is a symbol of life and death, it is solar and lunar, light and darkness, good and evil, wisdom and blind passion, healing and poison, spiritual and physical rebirth. The presence of a serpent is often associated with female deities and the great mother. In some cultures snakes are fertility symbols, and in others they symbolize the umbilical cord, joining all humans to Mother Earth. The snake is assigned many aspects. It is shown as a Dragon, a snake twining up a trunk or staff, and as a Naga sheltering the Buddha. In Christian mythology, the snake acts as tempter. It convinces Eve to eat the fruit of the tree of knowledge. The snake is evil, the devil himself. In many religions, the devil is a supernatural entity that is the personification of evil and the enemy of God and humankind. After Eve and Adam have eaten the fruit, God confronts them. Adam blames Eve and Eve blames the snake. God expels the two of them from the Garden and places a Cherubim at the entrance to keep them out. In his anger, God tells Adam that he will live by his labors, Eve will suffer in childbirth and the snake will forever be the lowest of the low. In Gnosticism, the snake is thanked for bringing knowledge to Adam and Eve. With knowledge, Eve and Adam are freed from the Demiurge’s control. I want to give credit to the serpent and to the woman who listened to the snake. Eve took a bite of the apple and a) she didn’t die, except to her old naive self and b) she was wiser and more conscious for having done so. By sharing her discovery with Adam he became wiser too. So instead of seeing the snake as the devil and the apple as sin, we need to be thankful for the disobedience, the curiosity to listen to something outside of the box, explore life’s possibilities, grow beyond childhood and listen to the wisdom within. Last month we had a spare story where we had to delve and dive for meanings, this month with Pandora’s Box we have a story rich with store-bought meanings, some of them diametrically opposed. I’m very curious about what will fly out as we unpack the story and shake out the wrinkles. I’ve been fascinated by Pandora since I was a little girl, hearing the story for the first time. I’ve thought of Pandora as very young ever since. No doubt I identified so strongly with her because I too was a child filled with insatiable curiosity. From the very first time I raised my hand in class to ask a question it marked me as different. Being an Army brat, I changed schools the way other girls changed clothes. There were plenty of opportunities for fresh starts in new environments; besides my mama didn’t raise dummies – I knew perfectly well if I wanted to fit in, or at the very least escape notice, I should throttle that insistent inquisitive other who kept shoving my arm up and flapping my hand around. But I couldn’t. Just like Pandora, I had to keep opening the box and suffering the consequences. It certainly didn’t escape my attention that Pandora and Eve had a lot in common; both being ‘first women’ blamed unfairly for letting mankind’s ills loose upon the world. From the get-go I got how unfair that was. Pandora is the dummling, the Fool, the innocent setting out on a journey for which she is totally unprepared. She hasn’t even had the benefit of a childhood with all its lessons of separation and betrayal to toughen her up. Zeus has ordered her freshly made and sent her like a time bomb into the world. So, she isn’t just my little girl suffering the normal slings and arrows of childhood, she is also every child used and abused by adults for their own ends. In this first collage we see young naïve Pandora carrying all the gifts the gods have showered upon her neatly packed in a basket, on her way to her new home. 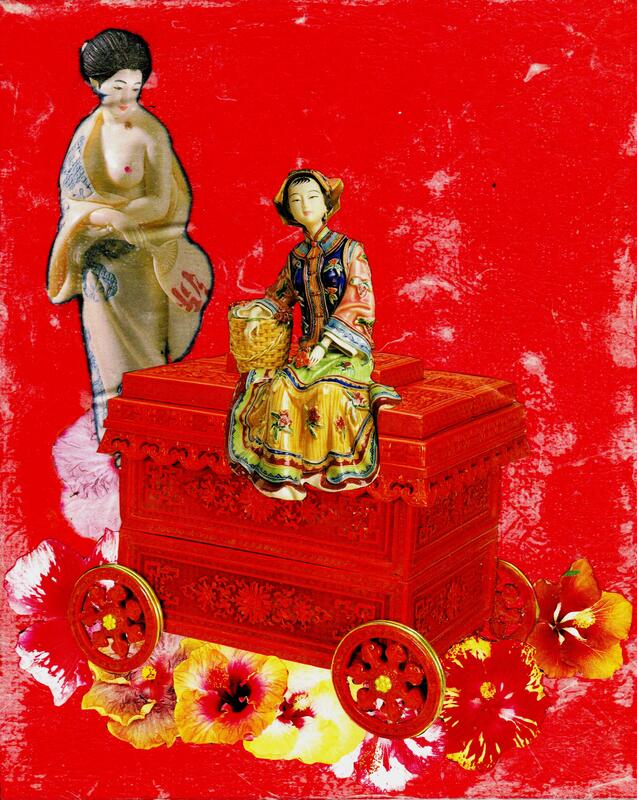 She rides on top of the hope chest of a bride and her path is strewn with celebratory flowers. Behind her hovers the shadow of the woman she has already, unbeknownst to her and without her consent, become – a sexual object to be bought and sold by men and gods in games of power. At this moment though, she is still unaware of her fate; still seeing the world as freshly painted just for her. The story begins with the sibling rivalry between Zeus and his brother Prometheus, which leads to the theft of fire for mankind, resulting in Zeus’s commissioning Pandora from the (male)smith Hephaestus before giving her to another brother Epimetheus as his bride. Perhaps the evils hidden in Pandora’s box will emerge out of this gross imbalance between feminine and masculine elements rather than the curiosity of Pandora. So I decided to zero in on the problem. Let’s look at the couple today … put them in the spot light. I imagine they are still fishing and still hoping to catch again the magic fish or some other enchanted creature. Because in their world it’s all about The Golden Fish. It is clear that the only way to get ahead is to get lucky and to get lucky means catching the Enchanted Fish Prince and start demanding wishes. The prompt this week is black and white. Light and dark, opposites and contrary are all synonyms associated with the idea of black and white. The Fisherman and his Wife seem to be opposites, but are they really? The wife is the Fisherman’s anima and she exemplifies his inner feminine. In the story, she gets the job done where he hasn’t been very effective. She makes demands and he goes along with her requests. Today I suppose she greets him daily and asks if he has seen the Golden Fish? The two of them are still stuck in a colorless world, only the Golden fish shines. If this story were a dream, the fish might represent spirituality and the Fisherman could be seeking patience and understanding. He is plumbing the depths of his own subconscious in order to find spiritual food. The wife is only interested in material things and positions of power. In this way, she is not looking after his inner feminine. They are acting contrary. Looking at the other symbols as part of this dream the Sea often represents the realm of emotions. Emotions are life – sustaining, cleansing and healing. Only the Ocean demonstrates the story’s main emotions. The Fish does not. The Fisherman grumbles and the Wife demands. Water is life, sacred and healing. The sea is the source of all life, the unfathomable. It also symbolizes infinite wisdom. The Ocean is associated with the Tao and the Great Mother. Nature in its divine wisdom, knows that things are out of balance and makes the needed correction. If the couple wants their life to change, they must stop expecting magic. They must work together in a positive way, they need to recognize their emotions and accept that they are not the center of the universe. They must change their greediness into generosity and their dissatisfaction in to joy. They must learn to balance their opposites. For this week’s prompt I chose to illustrate emptiness. Not that I think emptiness is a bad thing. I consider it more as the “negative space” defined in art as “the space around and between the subject(s).” In art, empty space can be used to create a silhouette, a background, a balancing counterpoint to an object or group of objects, or a place for the eye to rest. In life, emptiness can give the mind or heart or emotional body time to rest, recuperate and regroup. In metaphysics, emptiness is the void from which the spark of life arises and in physics emptiness is the great mystery. is in the use of what isn’t. Sometimes we need emptiness to understand the true utility or meaning of a thing, concept or action. When we first read this story we found it almost devoid of content; but the longer we spend with this seemingly empty story, the more it holds. Genesis tells us that in the beginning was the sea – … and God said, “Let there be an expanse in the midst of the waters, and let it separate the waters from the waters.” The Judeo-Christian religion is not alone in thinking the world evolved from water; many other theologians, scientists and psychologists agree. The sea encompasses this story – the story bobs up out of its depths. This fact alone is enough to make us sit up and take notice. The watery background of this collage forms the negative space around two objects, the fish and the boat carrying a woman and her sand castle. You may recall that the sea changes its appearance and mood each time the fisherman makes a new request. When he approached the shore to ask for the castle, the sea “looked blue and gloomy, though it was very calm.” The sea here is blue and a bit gloomy and very calm; empty of any kind of disturbance. It conveys a brooding season of waiting. My idea of Hell is waiting in an endless line without anything to read. I really dislike waiting. So my personal negative space carries undertones of frustration and impatience. I suppose it’s why I fall in so easily with the idea of “staying in the moment.” If the moment is all there is, then one never has to wait! The trick is practicing this sense of presence in the dentist’s waiting room! The fisherman’s wife is adorned with elaborate seashells. If you hold a seashell to your ear you can hear the ocean. What needs to be heard? Who needs to be listened to? For me, sitting on an empty beach surrounded by the rhythmic sound of waves is the closest I get to perfect harmony. I suppose it’s a point of arrival. At the very edge of the known world there is nowhere left to go, nothing to do except be one with the elements. Shells are wampum, a form of money in both South American and African history. The conch, sliced cross-ways, forms a perfect spiral, ancient symbol of rejuvenation and rebirth. Gods are born from seashells and this is the wife’s ambition – to become a god. Transcendent religions teach us that it is humankind’s best and truest aspiration to reclaim his/her god nature. To do so usually involves a trip to the underworld, as represented in the traditions of many sea-faring nations. The wife in my picture is plump, naked and crowned in a rather ridiculous headdress, all of which might indicate empty (endless) greed and desire. On the other hand she also appears poised, calm and completely self-confident. Perhaps, her crown connects her to Persephone, Queen of the Underworld. Perhaps, her actions in the story stem from a profound comprehension of the workings of fate and the sea. Her castle is made of sand – transient, ephemeral, easily washed away it’s a thing of illusion, yet the child’s pink bucket has been left in plain sight. Children are naked and truthful in the expression of desire; they know how to play and use their imagination. The boat, a tool of the fisherman’s trade, has become a frivolous pleasure boat. 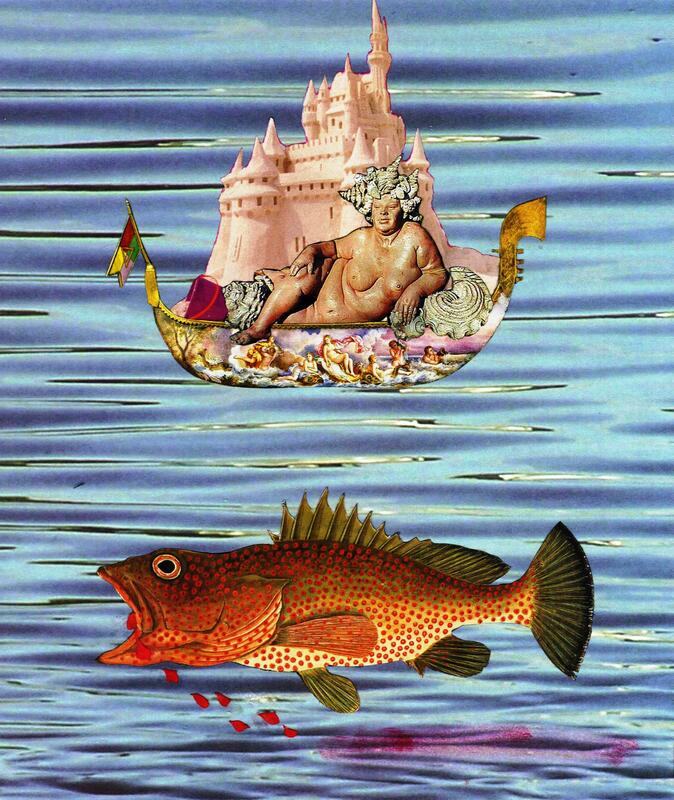 If this collage were the fisherman’s dream, we might ask him if his work gives him pleasure. Is he “following his bliss?” as Joe Campbell would ask. If so, does the fish bless him by returning him, at the end of the story, to the profession he loves? The golden fish is as enigmatic as any fish. Why does he do what he does? His mouth is open to speak, but he also bleeds from it. (Remember the bloody streak in the water when the fisherman lets him go free?) Bleeding is a kind of emptying out and links the story, once again, to the feminine. It also implies the kind of sacrifice in blood that magic and gods sometime demand. The wounded Fish/Prince is reminiscent of another story – Parsifal and his encounter with the wounded Fisher King. In that story, the hero, long dominated by an overprotective mother, doesn’t ask the questions he should ask at the beginning of the story. As a result he must take a long roundabout adventure that brings him back to where he started. There is one more story I’m reminded of. The “Arabian Nights” contains a tale about a fisherman who nets a jar containing djinn who threatens to kill him when the fisherman uncorks his catch. Through trickery, the man talks the djinn back into the jar and then returns the imprisoning container to the sea. To me, our story seems like a reverse mirror image of that one. In both, magical creatures, fishermen and the sea are involved and in both stories the characters end up in the same place they began. As in the tales from “A Thousand and One Nights,” our story contains the seeds of another wonder tale. How and why has the enchanted prince been turned into a fish? There was an Isabella (Isabill – fisherman’s wife) Geelvinck who lived in Bodensee, Germany in 1640 (Leon 138). Geelvinck disguised herself as a man and served in the army for a total of 15 years (Leon 138), serving as both a trooper and cook (Leon 138). After leaving the army, Geelvinck, still in male disguise, worked as a valet in Amesfoort in Holland until she decided to leave and stole some of her employer’s silver (Leon 138). She then went to Utrecht, where she worked as a maid until she was caught stealing more silver (Leon 139). She was allowed to finish out her contract (Leon 139). When her contract expired, she tried to burn down her employer’s house, was caught, tried, and sentenced to death. In March our focus will be on the Fairytale “The Fisherman and His Wife,” another German tale from the Brothers Grimm. (You can read an updated version of this tale by clicking on Monthly Tales listed on our blog site menu.) It is our intension to select stories from around the world. It just so happens that our first two Focus Tales have come from the Brothers Grimm. Next Month we will choose a tale, myth or story from another place and time. We will post on the first Monday of the month our Art Piece from the prompt The Big Picture along with a brief essay about our experience. First, I like to read several versions of the Fairy tale. I like to do a little research, too. Once I’ve broken the tale into its significant parts I start to figure out what I’ll need to illustrate the story, its theme and significance. Illustrating the story gives us a chance to get to know or re-familiarize our self with the tale. It lets us break down the tale’s basic building blocks so that we can reassemble them into an art piece of our own. If you are playing along with us, read the tale and then using the Big Picture as the prompt create a collage and/or mixed media art piece that expresses your feelings or ideas.